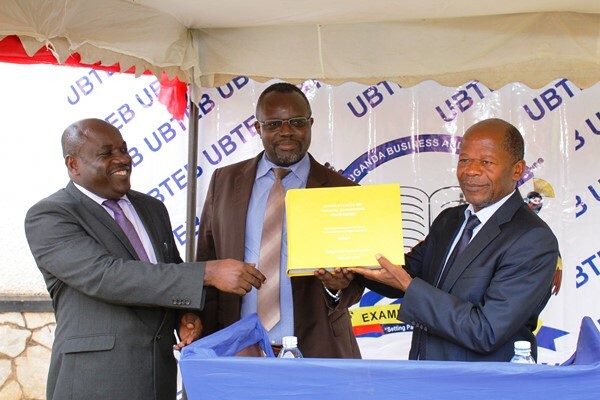 The Uganda Business and Technical Examination Board (UBTEB) has revealed that P.7 leavers who enrolled for a three-year certificate course in Community Polytechnic performed recorded runaway success in their 2018 exams. This week, the Executive Secretary of UBTEB Onesmus Oyesigye handed to the State Minister for Higher Education Dr. Chrysostom Muyingo, final results of 5,803 P.7 leavers who sat their exams in November last year. Oyesigye told Muyingo that out of the 5,803 that sat the UCPC and Advanced Crafts, 4, 678 successfully completed their exams and were considered to have passed. This represents a resounding success rate of over 80%. This technical training program was earlier categorized into two specializations – Uganda Community Polytechnic Certificate (UCPC) and Advanced Crafts. In 2016, the government phased out the Advanced Crafts course. But those who had enrolled for it managed to sit their exams, (1,677), 1,361 (81.2%) successfully completed and will go straight for Diploma course. But their counterparts who completed the 3-year UCPC course, will have to complete the National Certificate Level before they can advance for Diploma courses. This year, 4,126 sat the UCPC examinations and 3,317 (80.4%) passed. They can either join the world of work or join the National Certificate level. Oyesigye said the 809 (19.6%) of the candidates who did not succeed, are advised to register for reassessment of their competences at the next subsequent assessments to improve on their competences. Introduced four years ago, UBTEB organized inaugural UCPC exams for primary leavers last year. The certificate course is part of the government’s efforts to professionalize and formalize skills training and also absorb students who fail to advance to secondary schools. The UCPC programmes are for students that study in Community Polytechnics, Technical Schools and Farm Institutes that are admitted after completing Primary Seven (PLE). There are currently 492 accredited Examination Centres country wide for all programmes. Some of the courses administered under UCPC include Mastery of Trade Calculations MotorVehicle Technology, Radio & TV Fault Diagnosis. Minister Muyingo who represented his boss and First Lady Janet Museveni said the Education Ministry has been encouraging Ministries, Departments and Agencies to donate Motor vehicles to training institutions that will be used by students during practicals. Dr. Muyingo recognized the donation of old Motor Vehicles by the Judiciary to the Training Institutions through the Education Ministry, for Learning purposes and urged the Ministry of Education permanent secretary to work with fellow permanent secretaries and agency heads to give ICT support to the training institutions. “We will extend this practice to ICT equipment and integrate the private sector donors as I will ask the Permanent Secretary of the Education Ministry to collaborate with fellow Permanent Secretaries and Heads of Agencies to give support of computer-related equipment to these training institutions,” said Muyingo. Oyesigye cried out for additional funding by government to enable adequate and effective delivery of its mandate especially in practical oriented assessments. He proposed the reviewing of UCPC curriculum to align it better to Competency Based and Educational Training principles (CBET). He also called for the retooling of instructors as well as to government to support more a bigger quota of UCPC certificate holders intending to enroll for National Certificates programmes.